The first core value of the Agile Manifesto is to value individuals and interactions over processes and tools. When you allow each person to contribute unique value to your software development project, the result can be powerful. … This emphasis on individuals and teams puts the focus on people and their energy, innovation, and ability to solve problems. You use processes and tools in agile project management, but they’re intentionally streamlined and directly support product creation. The more robust a process or tool, the more you spend on its care and feeding and the more you defer to it. With people front and center, however, the result is a leap in productivity. An agile environment is human-centric and participatory and can be readily adapted to new ideas and innovations. If you do not know who your employees or co-workers are, if you are never with them when they are engaging in their work to note their individual styles and capacities, then you are part of the old corporate way of conducting business, and will not be able to succeed given the current needs that demand a more humanistic approach to problem-solving and increased production – in other words, needs that demand agility. What does it take to introduce yourself to a co-worker on another floor? What does it take to encourage an individual or team struggling with a creative problem? What does it take to tell someone, face-to-face, their work is well done? These small interactions can have a great effect on any individual. She/he will feel valued, needed, noticed, regarded, and will likely want to learn and work even harder to increase his/her potential. In it, he compares the vertical mindset and approach of corporations, which served them well one hundred and fifty years ago, to the horizontal approach that Agile offered in the late part of the 20th century as a response to changing needs in the world. 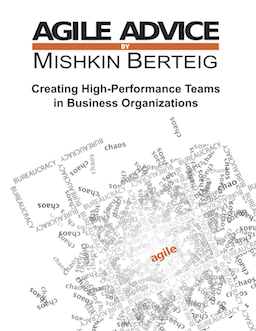 “Agile, Scrum and Lean arose as a deliberate response to the problems of hierarchical bureaucracy that is still pervasive in organizations today: falling rates of return on assets and on invested capital, a dispirited workforce… and widespread disruption of existing business models. Social media apps can be fun and helpful, but they cannot replace human face-to-face interaction. Think about Agile’s first value as a place to begin.